Unfortunately, FYI cannot forward any questions, comments, requests or mail to the creative staff of our programs. 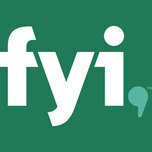 We do not maintain or provide contact information about the staff, the stars, guest stars, or guests of our programs. When that information is available, it is provided online. To reach your favorite stars try contacting the Screen Actors Guild in New York City or Los Angeles, CA to find out who their manager or agent is. They would be more apt to have their contact information.